Ty Burgess was arrested and charged last summer after allegedly ramming a police car in Abbotsford. Apr. 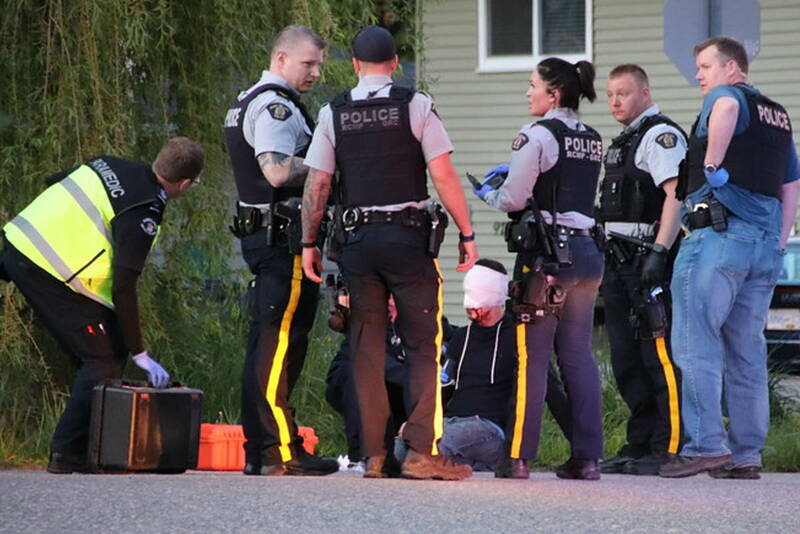 17, 2018 11:21 a.m.
A man who was wanted on a Canada-wide warrant last July for allegedly ramming a police car in Abbotsford and who was then arrested after a standoff in Chilliwack has been sentenced. But all of the charges related to that incident were stayed in court against Ty Burgess, 33. Instead, he pleaded guilty to a break-and-enter that occurred nine days previously, and was sentenced to 16 months in jail. Burgess was wanted on a parole violation on July 19, 2017, when officers went to a home in the 1800 block of Dahl Crescent in Abbotsford with the intention of arresting him. They say that as police were on their way to the residence, Burgess was in a vehicle heading in the opposite direction. They turned on their emergency lights to stop him, but instead he sped past them and sideswiped their vehicle, they said at the time. Police were not able to apprehend him, and two days later, they released his photo and said he was still wanted. On Aug. 10, the Abbotsford Police Department announced that charges had been laid against Burgess for the incident on July 19: obstructing a peace officer, dangerous operation of a motor vehicle, and fleeing from a peace officer. He was also charged with a break-and-enter that took place in Abbotsford on July 10. Police then announced on Aug. 18 that Burgess had been arrested that morning after officers surrounded a home on Woodbine Street in Chilliwack. Officers arrived there at 7:45 the previous evening, but Burgess did not surrender until between 2 and 3 a.m.
Burgess has an extensive criminal record, including involvement in a 2012 robbery of Ben Moss Jewellers in Richmond Centre. Burgess was sentenced in 2015 to a six-year jail term for his involvement in the robbery. Shane Buckner of Mission was sentenced to 10 years, and four others were also sentenced for being parties to the robbery. In 2010, Burgess was sentenced to a prison term of more than two years for using bear spray on a 65-year-old Chilliwack homeowner during a botched home invasion. The homeowner suffered a heart attack because of the incident, but recovered and later testified in court. Two days after the home invasion, Burgess was arrested in Coquitlam for an offence in Abbotsford. According to the provincial court database, Burgess also has prior convictions for possession of stolen property, break-and- enter, theft, assault, driving while prohibited and breaching his probation.